The brilliant new Lucas Davenport thriller from the #1 New York Times best-selling author. 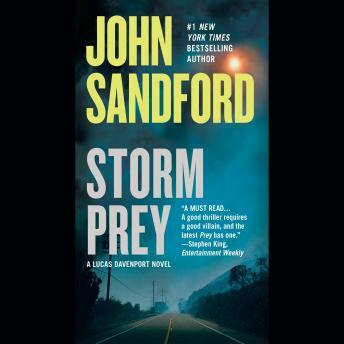 'Sandford's track record as a best-selling author is amazing, but it's not an accident,' wrote Booklist of Wicked Prey. 'His plotting is sharp, his villains are extraordinarily layered, and his good guys are always evolving. And this time, there's a storm brewing...Very early, 4:45, on a bitterly cold Minnesota morning, three big men burst through the door of a hospital pharmacy, duct-tape the hands, feet, mouth, and eyes of two pharmacy workers, and clean the place out. But then things swiftly go bad, one of the workers dies, and the robbers hustle out to their truck-and find themselves for just one second face-to-face with a blond woman in the garage: Weather Karkinnen, surgeon, wife of an investigator named Lucas Davenport.